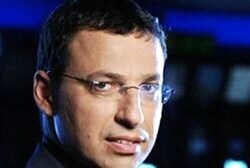 Israel’s media surrendered to emotion in its coverage of Gilad Shalit’s story and damaged the nation. Another sane person from Israel in a public position comes forward. This guy’s good…… Honest…… Up front. The world media needs more people like Raviv Drucker. This entry was posted on Wednesday, October 19th, 2011 at 07:45 and is filed under Main Postings. You can follow any responses to this entry through the RSS 2.0 feed. You can leave a response, or trackback from your own site. One Response to Israel’s media surrendered to emotion in its coverage of Gilad Shalit’s story and damaged the nation. I’m glad Gilad Shalit is home. I hope no one is killed by the 1100 (however many) terrorists that were released. But of course they will be. Many of the terrorists are being released in Jerusalem, where they were living when arrested. It’s a terrible thing to say, on the one hand, but one mans life, balanced against the death and destruction that 1100 terrorist will wreak on Israel, is not worth it. I’m truly sorry if this opinion is offensive to anyone.